Stems: Erect, 1-3, stout, simple to inflorescence, coarsely hairy. Leaves: Alternate, long-stalked below, nearly sessile above, palmately compound; leaflets 3-7, narrowly oblanceolate, 1-3 inches long, more or less coarsely hairy, pale below, middle leaflet longest; margins strongly toothed; tips blunt; stipules conspicuous, lanceolate to ovate, 1/2 to 1 inch long. Inflorescences: Cymes, many-flowered, terminal; branches ascending. Flowers: 1/2 to 1 inch wide; sepals 5, lanceolate, alternating with 5 narrowly lanceolate bracts; petals 5, 1/4 to 1/2 inch long, sulphur yellow; tips deeply notched; stamens 20-30. Fruits: Achenes, ovate to kidney-shaped, small, distinctly ribbed, dark brown to reddish purple, enclosing 1 tiny seed. Habitat: Roadsides, waste areas, old fields, and pastures. 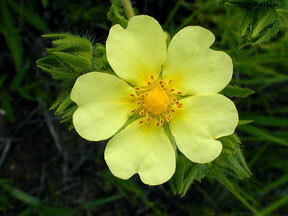 Uses: Native Americans applied the crushed leaves and stems of sulphur cinquefoil to open wounds and sores. Deer and sheep eat sulphur cinquefoil. Comments: This species occurs widely in Europe and is a serious weed in the northern Great Plains. Related to Old-field cinquefoil .